As more ad-free streaming platforms have come into play and trends of binge-watching TV shows increase, people desire to create a space that allows for the best movie-watching experience. 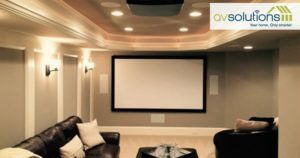 In fact, a recent Houzz Smart Home Study indicates that among renovating homeowners, 18 percent installed at least one smart device related to home entertainment upgrades. To answer the need for the appropriate space for entertainment, homeowners can choose between two main options – installing a home theater or upgrading the living room into a media room. While many might argue they serve the same purpose, the differences between the two spaces should not be ignored and should instead be kept in mind when considering the atmosphere and use of the spaces you are looking for. 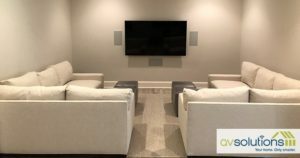 In this blog, we will break down the purpose of both a home theater and a media room and offer other considerations when planning your home entertainment selection. Home theaters are created as a dedicated space to create a movie theater in your home. Every detail of the room centers on the question, “Will this enhance the viewing experience?” From the seating to the lighting and surround sound, everything should amplify the ability to best watch the big screen. Seating is typically set up in tiered rows facing the screen, and the speaker selection should be just as important to the homeowner as the projector type, screen size and lighting design. Overall, installing a home theater allows the most control over the viewing experience. I would love to recreate a movie theater in my home. I want a space where I can go for uninterrupted movie watching. I have a room in mind that can create the perfect atmosphere for a movie theater. On the opposite spectrum, a media room releases some control of the movie-watching experience to allow for the flexibility of the events that will take place there. While a home theater will be dedicated to watching movies, a media room will be used more for entertaining guests. This may include watching TV, hosting nights to watch your favorite sports teams play, hosting a game night and even just carrying on a conversation with guests. This multipurpose space is much more open and relaxed than a home theater and might have different seating options (i.e., a couch, bean bags and recliners) that don’t necessarily directly face the TV. I like to host events where people can casually watch TV and/or hold a conversation. I want to update or upgrade my living room to better entertain my family and guests. I don’t mind having interruptions and distractions while watching TV. At AV Solutions, we can help you determine the best option based on your needs and wants. We would love to discuss how you would like to update your home entertainment systems.